Do you ever wonder what people 2000 years from now will think of our current society when they discover that we spent our days watching videos of angry-looking cats? I don’t, and it’s probably for the best. In any case, here are the biggest, best, bespoke memes that disrupted 2013. I’m not going to lie: I hate the Harlem Shake meme. Hate hate hate. And apparently, the rest of the Internet got tired of it quickly, too. The meme swept the Internet in February of this year and was featured just about everywhere, but by April it was all but dead, hopefully never to rise again. Besides, it isn’t even the original Harlem Shake: That was created back in 1981. What does the goat say? ‘GAAAAH!’ of course. As incomprehensible as the Harlem Shake was, “goats screaming like humans” is even more bewildering—but probably more amusing. And it’s way more self-explanatory: Do a search for “goats screaming” and you’ll get videos like this supercut and this compilation of goats inserted into music videos. And that’s only the beginning. Let’s take a moment to address the questions that really matter. What is the meaning of life? How can we end the suffering of the poor and needy? What does the fox say? No, really, what does it say? Apparently it’s an important enough question—and a silly enough notion—that the eponymous music video is closing in on 300 million views. It is the work of Ylvis, two brothers who host a comedy show in Norway. Now, we actually know what the fox says, but as it turns out, the song wasn’t too far off the mark. It’s not every day that space rocks fall from the sky. OK, actually, it is every day. But meteorites like the one that streaked through the sky over Chelyabinsk, Russia in February don’t come around that often. Thanks to the dashboard cameras that are ubiquitous in that country, the Internet got to see some incredible footage of the meteorite as it streaked overhead, as well as some of the damage it caused. Oh, Miley. In the spirit of Bonnie Raitt, you sure gave the Internet something to talk about in 2013. From “Wrecking Ball” and the resulting parodies to twerking at the VMAs, Miley Cyrus, for better or for worse, had the Internet buzzing throughout the year. She was in the running for Time’s Person of the Year honors, and “what is twerking” was one of Google’s top search queries for 2013. If you’re going to quit your job, do it in style. Marina Shifrin worked at a company that focused on producing news videos. Concerned about a reduced focus on quality work, Marina decided to leave her job. But instead of handing her boss a traditional letter of resignation, Marina put hers in video form, complete with Kanye West and interpretive dance. Seventeen million views later, it’s a YouTube sensation. Every now and then, something comes along that makes everyone go, “how the @#$% did they do that?” And this year, that honor goes to this fairly epic Volvo Trucks ad featuring Jean-Claude Van Damme. The video features Van Damme doing the splits while being supported by two big-rig trucks that are in motion. In reverse. Holy carp. The video has over 60 million views and counting as of this writing, and it’s only about a month and a half old. Wow doge. So example. Very Internet. After years and years of cats dominating the Internet, dog lovers were finally thrown a bone in 2013 with the emergence of the Doge meme. The meme typically features photos of Shiba Inu dogs with internal thoughts overlaid in brightly colored Comic Sans. And it’s frickin’ awesome. 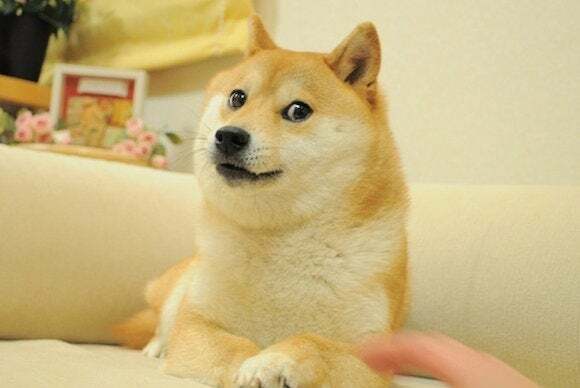 You might find yourself spontaneously speaking in doge. Such language. So words. Very thought. Wow. Of course, Doge wasn’t the only dog meme to capture the Internet’s attention in 2013. Meet Menswear Dog, an unreasonably fashionable Shiba Inu who probably dresses better than you do. So fashion. Such trend. Also doge. Much wow. But even though dogs may finally be getting some online love, I think we’ve established that the Internet is made of cats. Internet cats never go out of style, and their legend only grew in 2013. TechHive's Leah Yamshon poses with Grumpy Cat. So grumpy. Take a look at the meteroic rise of Grumpy Cat. This humble surly-looking feline otherwise known as Tardar Sauce went from mere meme and YouTube sensation to a cultural phenomenon. She made an appearance at SXSW, became a spokescat for Friskies, and even has her own line of coffee drinks. Come to think of it, Grumpy Cat kind of sold out in 2013. But that's okay—we still love her. So here’s to you, Grumpy Cat and Princess Monster Truck and Chairman Meow and Lil Bub! Thank you, all you awkward cats of the Internet for making everything more fun and reducing productivity the world over. And a special thanks to the cat on the swing. You are my new Internet hero. This story, "Gone viral: The memes and videos that defined 2013" was originally published by TechHive.